Now that we’re finally here, it’s time to get down to the business of hiking & biking, which are the reasons we love to come to Arizona. John headed off with the bike gang yesterday on a 47 mile ride to Tubac. Coffee at the 1/2 point, and wheel to wheel flying down the road on the way home. Always a pleasure. Today was our first hike with the RV Park group. Brown Mountain in Tucson (near the Desert Museum, if anyone has been here before). 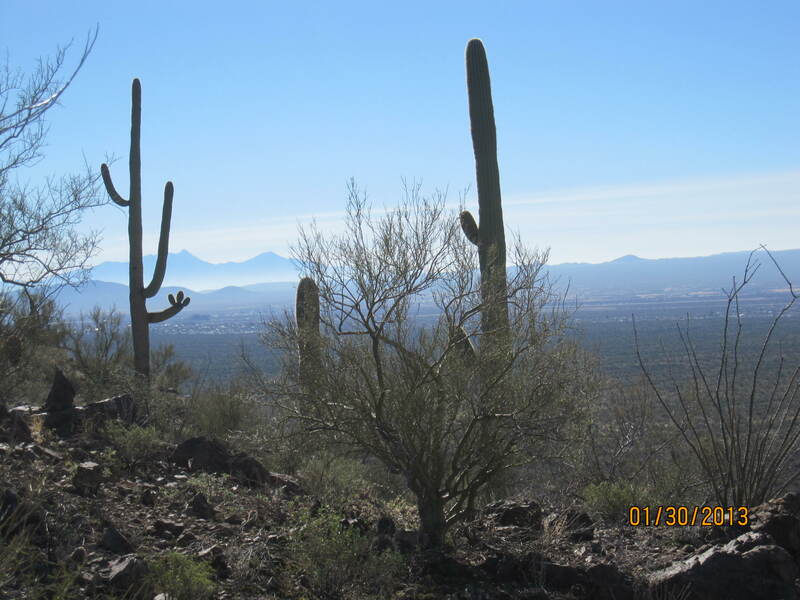 Saguaro cactus – the only place they grow in the world is in the Tucson area. It was about 4-1/2 miles round-trip, mostly uphill to the halfway spot, winding around back to our starting place. Lunch at the picnic area at the end. Some hikers in our group have vast experience. Several have thru-hiked the Grand Canyon in one day (27 miles). Don’t use the word “senior citizen” around these folks! 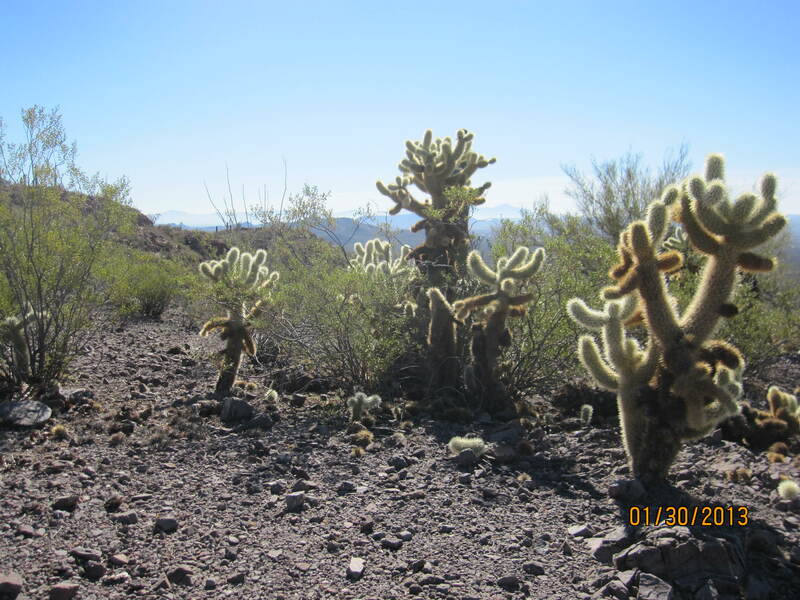 Jumping cholla cactus. Be careful, as any close contact will enable a chunk of cactus to stick to you. Tomorrow’s a cycling day again. Life is good…. 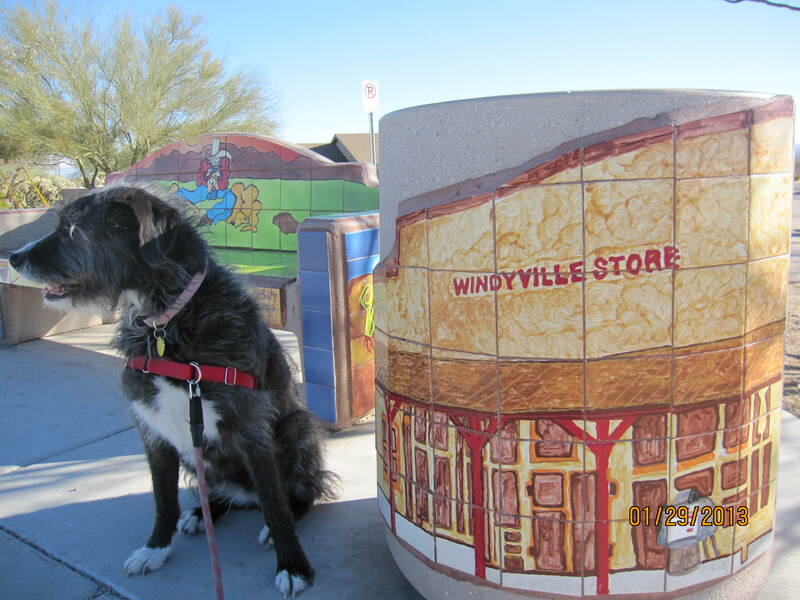 Jezzy, a trash can, and bus stop bench. Great pics Judy. Wish I was there with all of you! Joyce and I got together tonight and commiserated over a couple glasses of wine. We talked about you. FYI, the saguaro cactus grows only in the Sonoran desert which extends to southern Baja California. We see lots of them in Cabo. I’m seriously jealous as we face another weekend of snow after a couple days of warm wet weather. Beautiful pics. Have a blast.